Professor Lisa Jardine, Professor of Renaissance Studies at University College, London, who died recently, famously dismissed Larkin as a ‘casual, habitual racist and an easy misogynist’. However, the Dean of Westminster Abbey, the Very Revd Dr John Hall, decided it is ‘the right time’ to honour Larkin, and more recent academic thought, and study of his letters, has suggested that his outdated opinions were often tongue in cheek, and in reality the life he led and his actions did not suggest a man who harboured bigoted opinions. The jury is of course still out. The stone includes words from one of his best-known poems, An Arundel Tomb (1964): our almost instinct almost true What will survive of us is love. 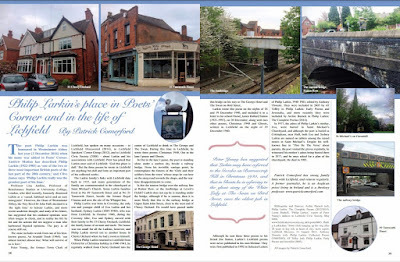 Peter Young, the former Town Clerk of Lichfield, has spoken on many occasions – to Lichfield Discovered (2014), to Lichfield Speakers’ Corner Group (2012), and to Lichfield Civic Society (2008) – about Larkin and his associations with Lichfield. Peter has joked that Larkin once said of Lichfield: ‘God this place is dull.’ But the three poems he wrote in Lichfield are anything but dull and form an important part of his collected works. The Larkin family’s links with Lichfield date back to 1757, and many generations of the family are buried in the churchyard at Saint Michael’s Church. Some Larkin families lived at No 49 Tamworth Street and at No 21 Tamworth Street, beside the former Regal Cinema and now the site of the Whippet Inn. Philip Larkin was born in Coventry, the only son and younger child of Eva Larkin and her husband, Sydney Larkin (1884-1948), who was from Lichfield. 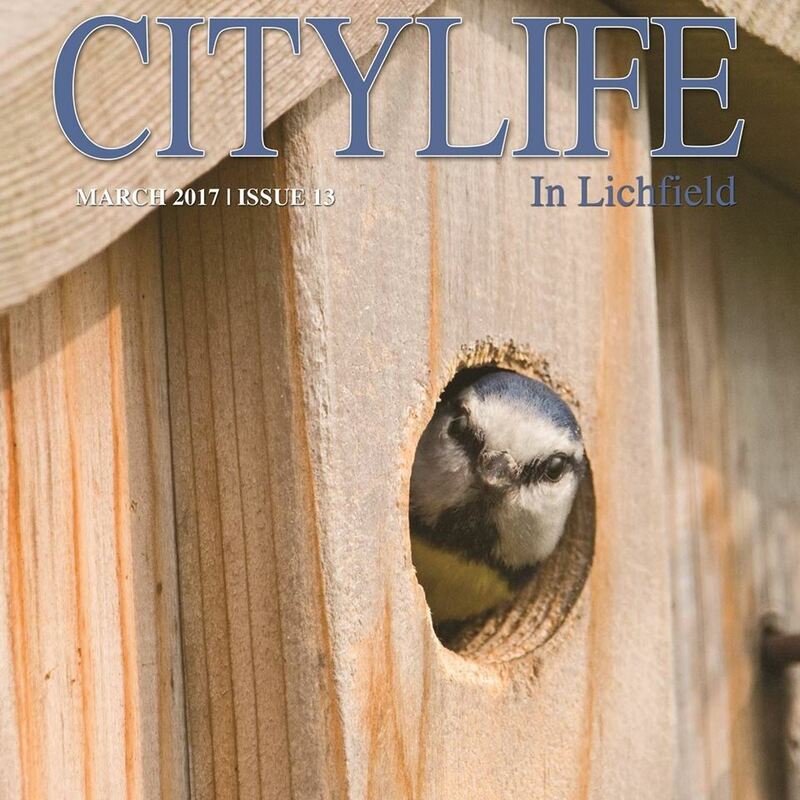 In October 1940, during the Coventry blitz, Eva and Sydney moved with their family to No 33 Cherry Orchard, Lichfield, the family home of an aunt and uncle. The house was too small for all the Larkins, however, and Philip Larkin moved out to another house in Cherry Orchard where he had a room to himself. When Philip Larkin returned to Lichfield from Oxford for a Christmas holiday in 1940-1941, he regularly walked from Cherry Orchard into the centre of Lichfield to drink in the George and the Swan. During this time in Lichfield, he wrote three poems: Christmas 1940, Out in the lane I pause and Ghosts. In Out in the lane I pause, the poet is standing alone under a starless sky beside a railway bridge. From his invisible vantage point, he contemplates the futures of the ‘Girls and their soldiers from the town’ whose steps he can hear on the steep road towards the shops, and the war-time disappointments to come. Is this the narrow bridge over the railway line at Rotten Row, or the footbridge at Levett’s Fields? Larkin does not say he is standing under the bridge, although if he is unseen, then it is more likely that this is the railway bridge at Upper Saint John Street, close to the west end of Cherry Orchard. He would have passed under this bridge on his way to the George Hotel and the Swan on Bird Street. Larkin wrote this poem on the nights of 18 and 19 December 1940, and included it in a letter to his school friend, James Ballard Sutton (1921-1997), on 20 December, along with two other poems, Christmas 1940 and Ghosts, written in Lichfield on the night of 19 December 1940. Peter Young has suggested that Larkin may have referred to the Gazebo on Borrowcrop Hill in Christmas 1940, and that in Ghosts he is referring to the ghost story of the White Lady at the Swan on Bird Street, once the oldest pub in Lichfield. Although he sent these three poems to his friend Jim Sutton, Larkin’s Lichfield poems were never published in his own lifetime. They were first published in 1992 in Selected Letters of Philip Larkin, 1940-1985, edited by Anthony Thwaite. They were included in 2005 by AT Tolley in Philip Larkin: Early Poems and Juvenalia, and more recently they were included by Archie Burnett in Philip Larkin: The Complete Poems (2014). In 1977, the ashes of Philip Larkin’s mother, Eva, were buried in Saint Michael’s Churchyard, and although the poet is buried at Cottingham, near Hull, both Eva and Sydney Larkin are named on tablets among the raised stones in Saint Michael’s. Despite his well-known line in ‘This Be The Verse’ about parents – They f**k you up, your mum and dad’ – the poet visited the graves regularly, he witnessed his mother’s ashes being buried there in 1977, and he once asked for a plan of the churchyard. He died in 1985. Patrick Comerford has strong family links with Lichfield, and returns regularly. A former journalist, he is an Anglican priest living in Ireland and is a theology professor. Archie Burnett (ed), Philip Larkin: The Complete Poems (2012/2014); Lorna Bushell, ‘Philip Larkin,’ report of Peter Young’s address to Lichfield Civic Society, May 2008; ‘Town clerk hanging up his wig after 28 years in key role at heart of city,’ news report, Lichfield Mercury, 21 August 2015; Anthony Thwaite (ed), Philip Larkin: Collected Poems (1988/2003); AT Tolley (ed), Philip Larkin: Early Poems and Juvenilia (2005). 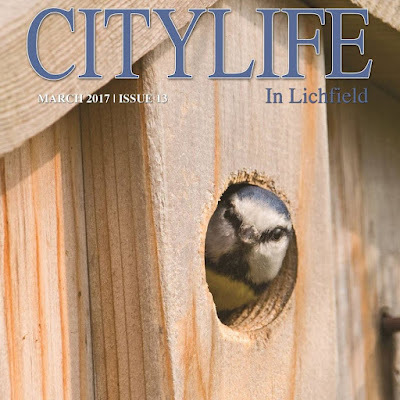 This two-page feature is published in ‘Citylife In Lichfield,’ March 2017 (No 13), pp 38-39. It is now a week since Ash Wednesday, and I wonder how many of us remember, let alone have kept, the Lenten resolutions we made with the best of intentions a week ago. This week, from Sunday (5 March) until Saturday (11 March), the USPG Lent Prayer Diary follows the topic ‘Introducing Discipleship.’ The topic is introduced in the Prayer Diary in an Article by the Revd S Balasundram, a priest in Colombo, Sri Lanka, who is training with the USPG-funded Asian Theological Academy. Today, we acknowledge our vulnerabilities and human frailties – but we rejoice that God is willing and able to make us whole. May we discover how to become our authentic selves – alive in Christ!